There's another great way to make lots of wow gold and it can be combined with the previous method (Treasure hunting)! It's called Rare monster hunt! This addon will pop an alert when a rare monster is nearby so you don't have to create a targeting macro and spam that. 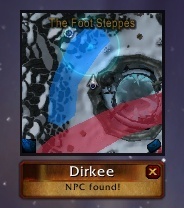 If you download the overlay too, all TBC, Wotlk and Cata rare spawn points will be shown on your map so you can easily see where a rare might be found. It's always worth it to check them when you're in the zone. Note: Wotlk rare loot is harder to sell, so there is little point farming Northrend rares, except those in starting areas. Some TBC and Classic items however are very valuable! Listed Armagedillo's Tail just a couple week ago for 1500G... was undercut within the hour w/ 3 listings at 150-200G.... waited a few days, listed it again at 1500, same story, immediately undercut by about 75%.... how do you deal w/ this type of insane undercuts??? I haven't seen many Tails for sale, but if I do, I just buy them if they undercut me a lot, like I do with every item :) More gold for me! Though Armagedillo is a bad example, someone could park their alts on top of it's spawn location and get a tail a few times a day. But I don't think they will do that forever, and when they stop, you have a bank full of Tails which all should sell for even 3k if you have patience!